Outstanding achievements in research and teaching – these are the basic prerequisites that RWTH Aachen University demands from candidates for an extraordinary professorship. Dr. Rainer Dahlmann undoubtedly meets these requirements and has now been awarded the title of “Extraordinary Professor” for his achievements. 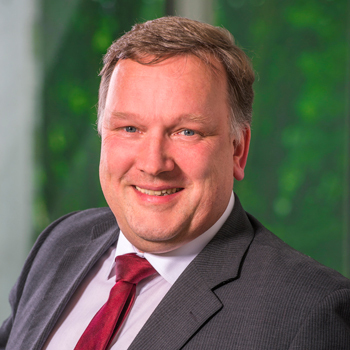 Rainer Dahlmann is Head of the Centre for Analysis and Testing of Plastics (KAP) and Scientific Director at IKV. As a lecturer he has held various teaching positions in the Bachelor's and Master's degree programmes in Applied Polymer Sciences at FH Aachen and in Mechanical Engineering and Plastics and Textile Technology at RWTH Aachen University since 2007. He is actively involved in the Collaborative Research Centre SFB-TR87 “High-Performance Plasmas for the Synthesis of Nanostructured Functional Layers” both as Principal Investigator and as a member of the Executive Board. IKV congratulates Professor Dr. Rainer Dahlmann on this achievement!